Summer in Bhutan falls between the months of June till mid-September. During these months, Bhutan experiences the most amount of rainfall, which helps its agriculture sustain roughly 70% of its population. The terrain in Bhutan can be divided into three basic zones. First of all, the hot, humid, tropical southern border of Bhutan, consisting of townships such as Phuensoling, Gelaphu, Trashigang, and Samdrup-Jongka. Here it produces most of its tropical agriculture about 150m above sea level and gets about 8,000 mm of rainfall annually, largely from the south-west monsoon hailing from the Bay of Bengal in the summer. 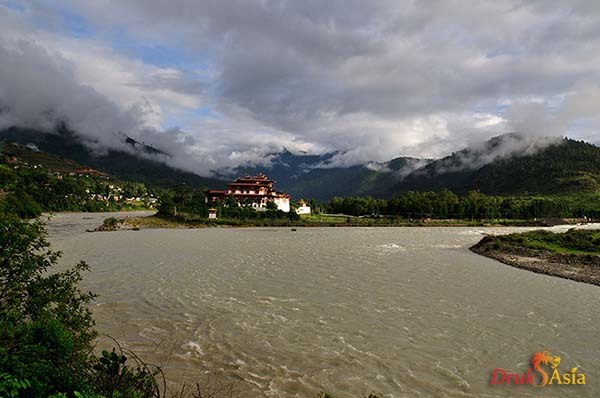 Secondly, temperate Bhutan, which consists of cities such as, Paro, Thimphu, Punakha, Trongsa, and Bumthang, is approximately 2000 to 4000m above sea-level, and receives about 1000mm of rainfall annually. These precipitations frequently come during the summer, from months June to mid-September. During this period, travelers can expect occasional late-afternoon showers once every 2-3 days. However, there will also be occasional drizzles that last through the entire day. Lastly, alpine Bhutan placed in the northern reaches of the Kingdom, typically 4000m above sea level, experiences little rain. The alpine Lunana, Jomolhari, and Snowman Trek are open for trekking from as early as July. When you travel in temperate Bhutan during these months, expect lush green pines while meandering through the valleys. The precipitation during these months creates some of the most stunning and dramatic landscapes, accompanied by lush greens, low cloud cover, and narrow unfolding valleys. Additionally, travelers can also expect to witness a multitude of rainbows while travelling to the valleys every day. The moist weather during the months of summer in Bhutan also harvests abundant, lush vegetation in Bhutan. In temperate Bhutan, this is the season of the mushroom collection in the damp forest surroundings. Exotic and tasty mushrooms like the Shishishamu, coral, and the famous Matsutake mushrooms are available at Ura and Genekha (near Thimphu). For those who are adventurous, venture into the temperate forests in those regions to gather mushrooms for your dinner. Otherwise, you can also travel to Ura to attend the Matsutake Festival, which lands in the 4th weekend of August. During the festival, learn to identify edible mushrooms, embark on mushroom picking excursions, and sample delicious Matsutake recipes while listening to folk songs echoing through the valleys. Established in 1995 the Annual Drukair Golf tournament is the most prestigious golf tournament in Bhutan. Set at the 9-hole Royal Thimphu Golf Course, this event attracts golfers from all around the region to tee off at the course overlooking the beautiful Tachichodzong. This tournament usually takes place in mid-August. Here, travellers will witness the gathering of locals across the village celebrate for better harvest and prosperity across the land. This dance festival dramatizes Guru Rinpoche defeat of Shelging Kharpo. Travellers will get to see a rare display of a large thangka depicting the eight manifestations of Guru Rinpoche. Situated west of Paro and crossing the highest drivable road, Chele Pass, lays the district of Haa Valley. The Haa Summer Festival is a lively and uplifting celebration of the traditional living culture, nomadic lifestyles, unique Bhutanese cuisine, traditional sports, and religious performances. Join 15,068 travelers who have benefited from our expertise.